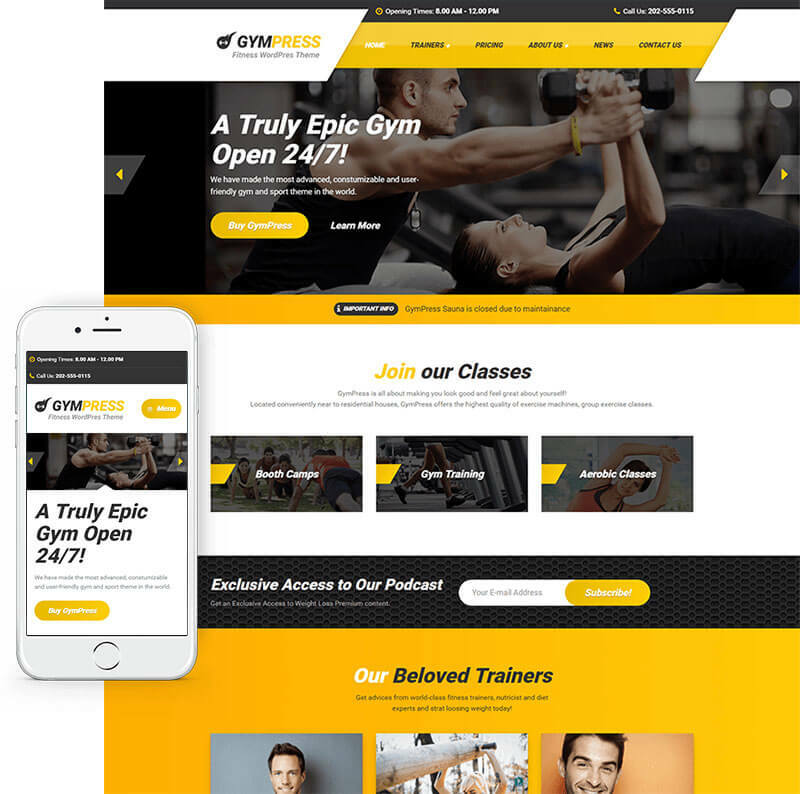 We have analyzed over 100 successful gym and sports websites to design the perfect mix of design and functionality that will fit your client's needs. Choose from a variety of pre-built widgets that are easy to edit and very customizable for you as the developer, while simple to use for the website visitors. 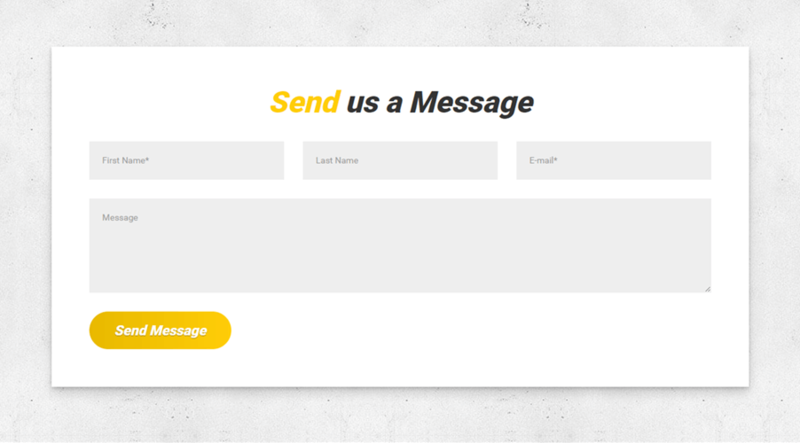 The homepage greets a new website visitor with an engaging slider, that will display content in a beautiful and unique way. It also includes easy to navigate menu bar and the most important information: the logo, opening times, phone number, social media profiles and extra space for any additional message. Display your websites main categories with a clean and structured layout, which will attract visitors and give them clear directions. 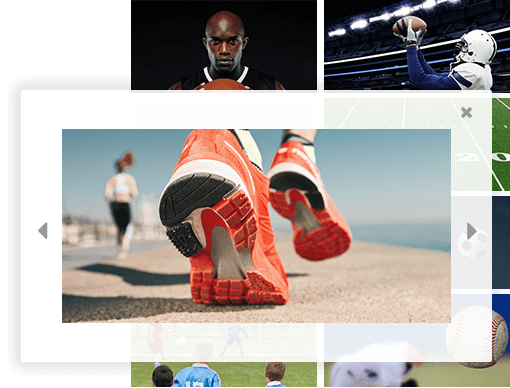 Take your clients collection of the best moments captured during sport and fitness activities. Then show it to website visitors in a gallery that’s fast and simple to view. 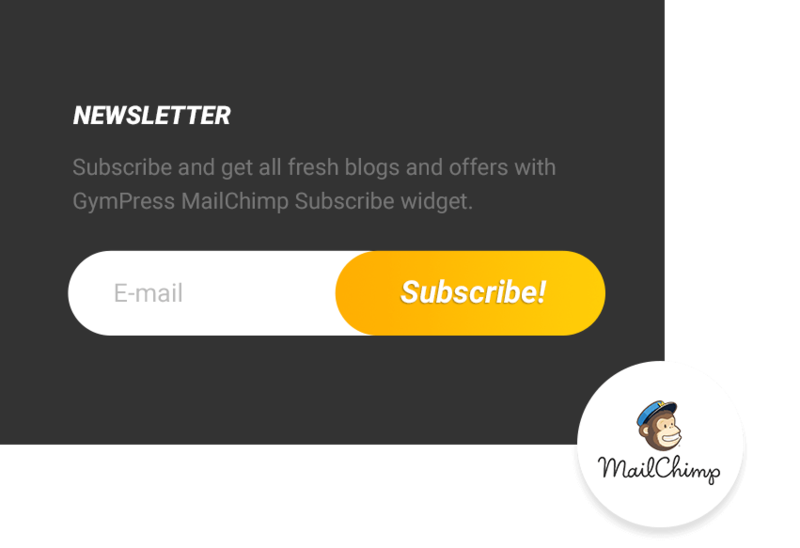 MailChimp Subscribe widget helps you build a mailing list with ease. Connect your MailChimp account with the widget in a couple of seconds and start turning your website visitors into subscribers. Ensure the visitors can see the most practical information right away. This will help them plan their visit or make an appointment at the correct time. You can also add an extra text to describe opening times during holidays. 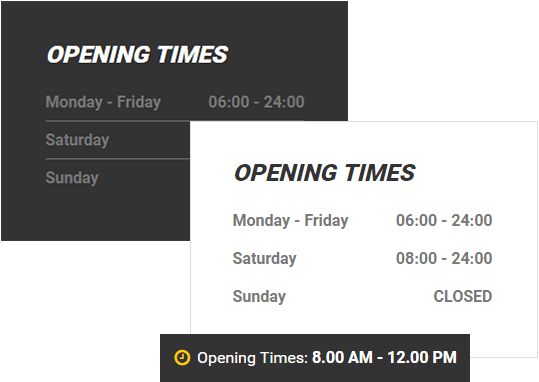 The opening times widget supports multiple locations, so you can set different opening times for different business locations. The portfolio grid widget allows you to group activities into different categories and present them with a clean design of an image, title, description and the price. Add a unique title in the black box for any important information you want to highlight. Let gym members know, which classes are planned on which day and time. They won't have any more excuses for missing out the next crossfit class ever again. Nothing convinces gym prospects more, than success stories from existing customers. 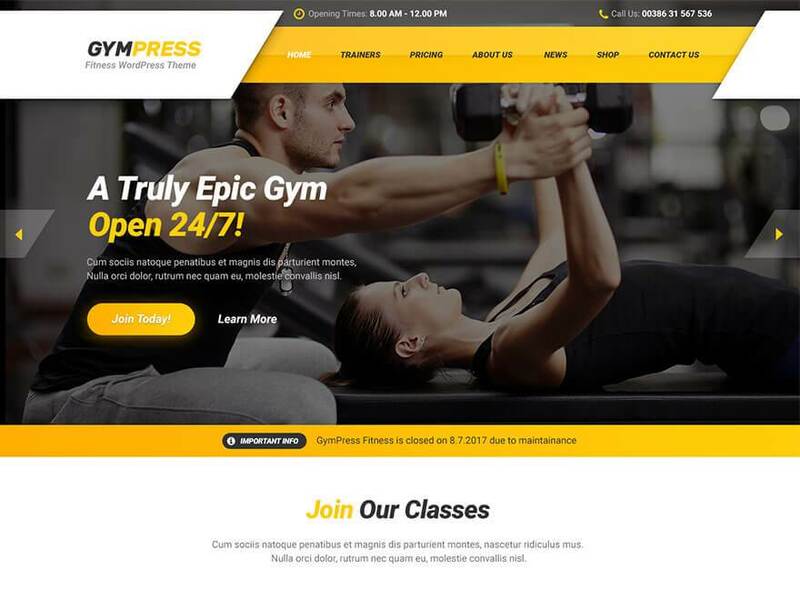 Bring your client new gym members by including this powerful and easy to use testimonial widget. 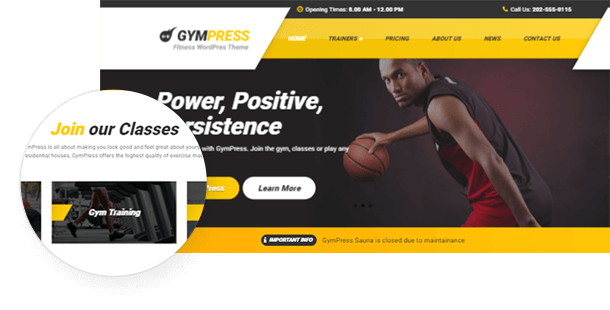 Use the GymPress theme demo to quickly upload your client’s logo, change the primary colors, and switch the slider image. This will enable your client to interact with their potential website, and help you close the deal. Introduce the team of personal trainers, coaches and gym instructors in a beautiful way. Provide their areas of expertise and links to their social networks. The greatest feature of them all, is adding a clickable slider and video integration for the extra appeal. This useful and important counter will let visitors know e.g. how many machines are in the gym, how many trainers work there and which hours of the day are least busiest at the gym. The accordion widget allows you to create a simple and clean F.A.Q. 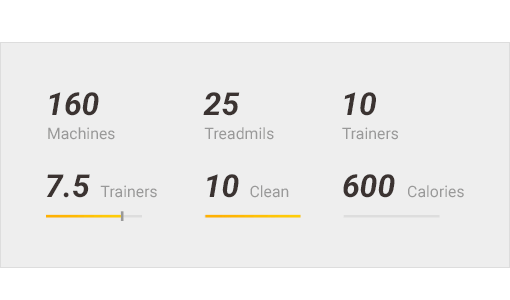 box, which presents a unique opportunity to directly address concerns and remove obstacles on the path to visitors signing up as a fitness member. An easy and fast way to let website visitors contact you directly from the website. You can also add more fields to get interesting information from the visitors (like, what’s their purpose of signing up for the gym membership). 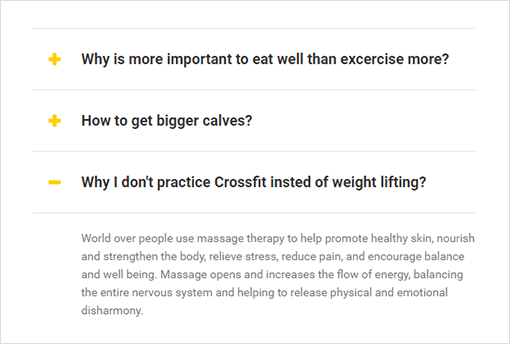 If the personal trainer wants to have his own contact form, you can easily set it up for each one of them. 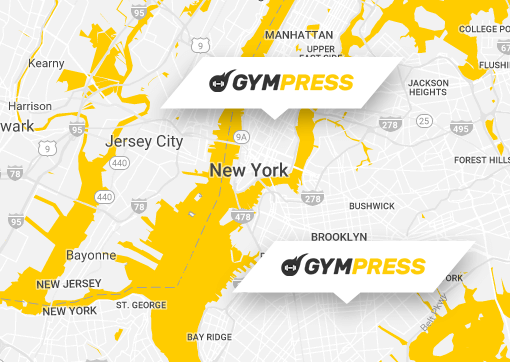 Use Google Maps widget and let visitors know where to go for losing weight or gaining muscles. It also allows you to upload your own marker (pin), so it matches your clients' brand colors. You can choose between full-width map and a boxed version. 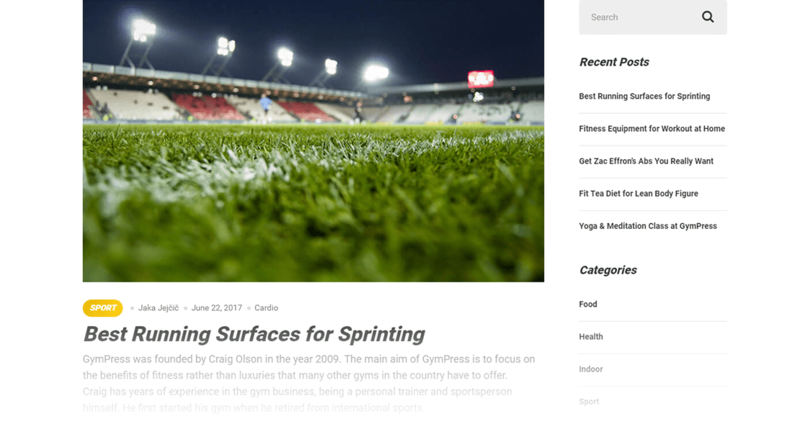 Every latest article, with its thumbnail image, post title, date, and description, will be automatically updated into a beautifully designed overview. Beautiful store design has everything you need to start selling your clients' products that are required to lose weight and gain muscles quickly. This is the best WordPress design I have ever used. I’m not talking just design, I mean, the way the end-user (me) can edit it, its so well put together that I hope you guys have other themes I can use. I’ll keep purchasing from you guys. A++++ on this theme. Very well done!! !